But if you have the right attitude and the proper sense of style, you can be Queen of the Mini-Vacay. Happy Hump Day! Whatever you do today, do it with flair! I don't think think the Queen of Sheba could put much flair into this outfit I'm wearing this morning. Guess I'd better change before I go to the store. Hmmm, now where is my pink hat...? 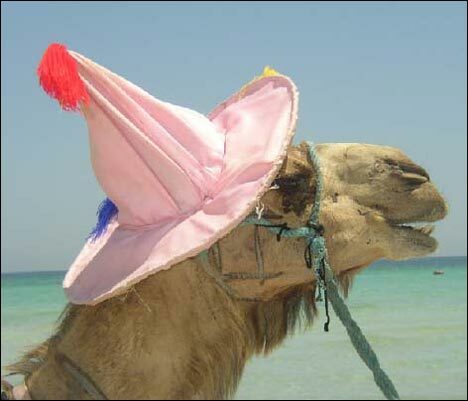 if you're having as much fun as that camel, i'd say you're definitely enjoying your mini vacation. bravo! I have that same hat in purple. That camel clearly has more fashion sense than I do. That might be one of my favorite camels yet. Oh, that's just too great. Takes a lot of self-confidence to wear a hat like that and still hold your head high!